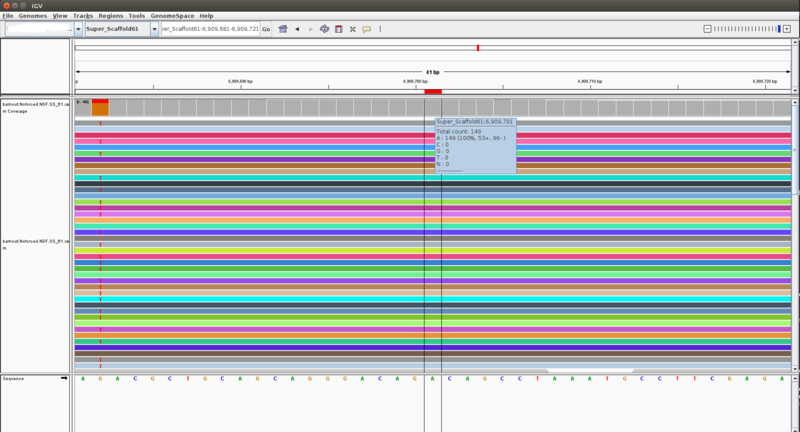 I am doing SNP calling with GATK 3.8 on whole genome sequences of 12 pools (50 diploid individuals in each pool, genome size ~900 Mbp) of a non-model organism with scaffolded reference genome (114K fragments now stitched into 94 super-scaffolds). Second, I obtained a single gVCF file per pool sample by merging the gVCF files of each of the 94 super_scaffolds of a given pool sample. INFO  17:15:24,859 HelpFormatter - Executing as xxxxxxx on Linux 2.6.32-642.6.2.el6.x86_64 amd64; Java HotSpot(TM) 64-Bit Server VM 1.8.0_74-b02. WARN  17:16:20,705 StrandBiasTest - StrandBiasBySample annotation exists in input VCF header. Attempting to use StrandBiasBySample values to calculate strand bias annotation values. If no sample has the SB genotype annotation, annotation may still fail. WARN  17:16:20,707 StrandBiasTest - StrandBiasBySample annotation exists in input VCF header. Attempting to use StrandBiasBySample values to calculate strand bias annotation values. If no sample has the SB genotype annotation, annotation may still fail. Following the instructions of the ERROR message, I set the argument -Xmx to 32g and run the program again, then tried 256g and finally 512g, always obtaining the same error message. I understand this problem is not of GATK but of Java, however, I don't have access to larger memory resources than 512GB RAM. Thus, I was wondering if you could please indicate me how to reduce the demand of memory by GATK when running GenotypeGVCF, hopefully not compromising sensitivity of SNP calling on pool data (e.g. I would prefer keeping ploidy equals to 10). Which parameters and in which step (HaplotypeCaller or GenotyGVCFs) would you recommend to make the changes? In pool data I am mostly interested on obtaining read counts per allele, not genotypes (as these are not individuals). I was considering reducing -maxNumPLValues to 10000 but then I would have PLs not being calculated when running GenotypeGVCF...but I am not sure how this may affect SNP calling. I think this issue is related to the one described in this thread. The fix is in review, and hopefully should be in the nightly builds soon. The logger error is really just a wiring problem. If your run completed with status done you shouldn't worry about it. We do have a fix for this; I expect it'll be in the next nightly build. Unfortunately the PL and GT limiting arguments haven't been wired up to GenotypeGVCFs yet. They only work for HaplotypeCaller. 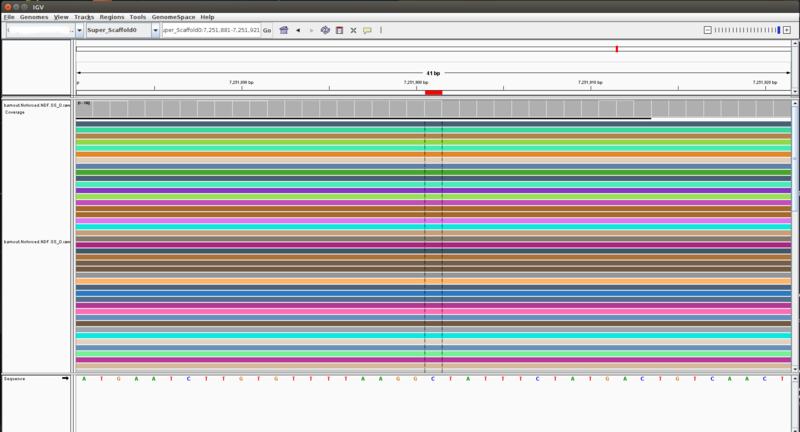 They show up in GenotypeGVCFs because of some shared code but this tool doesn't know what to do with them. Sorry about that -- we plan to address it in future work. Okay. Let me get this straight. You have already ran on all 9 scaffolds? Only one of the 9 scaffolds did not finish? Which values did you use for relaxed and stringent in those runs? Those warn statements are telling you that the tool is skipping over those regions because there are too many possible genotypes. If you increase the value of PLs, then the tool won't skip over them. As for choosing the PL threshold, you are correct that if you are interested in 4 alleles (3 alternate alleles), you would have a maximum of 286 PLs. So, you will need to set the maxPLs to 286. You will also need to set the maxGenotypes to 286. Thanks very much for your prompt response. I will keep an eye on that thread to get to know when the issue is fixed. I was wondering whether I may need to re-run all the analysis (HaplotypeCaller and GenotypeGVCF) with the nightly build of GATK 3.8 that would include the fix, or I would just need to repeat the GenotypeGVCF part (using as input the gVCF files generated with the stable version of GATK 3.8). Also, would you recommend me to conduct this analysis with GATK 3.8, or should I switch to GATK4 now? My concern on doing it is that there are two bugs related to GentypeGVCF in GATK4 that are under review. I need to obtain results ASAP but would prefer to use the most stable GATK version to date. GATK4 is still in beta, although we are recommending people test it out. If you need the results ASAP, you should stick with GATK3 as the stable non-beta version. However, after each run of the HaplotypeCaller I did obtain a gVCF file and the message Done. --------------------------- in STDOUT. Therefore, could I assume the gVCF files obtained despite the StatusLogger error message are fine? Thanks so much for working on the fix. Much appreciated! Just wondering, has the fix for the logger error been implement in the latest nightly build? INFO  11:06:16,543 HelpFormatter - Executing as [email protected] on Linux 2.6.32-642.6.2.el6.x86_64 amd64; Java HotSpot(TM) 64-Bit Server VM 1.8.0_74-b02. WARN  11:07:14,994 StrandBiasTest - StrandBiasBySample annotation exists in input VCF header. Attempting to use StrandBiasBySample values to calculate strand bias annotation values. If no sample has the SB genotype annotation, annotation may still fail. WARN  11:07:14,995 StrandBiasTest - StrandBiasBySample annotation exists in input VCF header. Attempting to use StrandBiasBySample values to calculate strand bias annotation values. If no sample has the SB genotype annotation, annotation may still fail. WARN  12:53:39,333 AFCalculator - Maximum allowed number of PLs (4000000) exceeded for sample 7iA at Super_Scaffold61:5611797-5611797 with 20030010 possible genotypes. No PLs will be output for these genotypes (which may cause incorrect results in subsequent analyses) unless the --max_num_PL_values argument is increased accordingly. Unless the DEBUG logging level is used, this warning message is output just once per run and further warnings are suppressed. Before, using the standard 3.8 version, 15 out of 94 super-scaffolds did not work; with the nightly build, now 9 of the initial 15 problematic super-scaffolds still don't work. That is an improvement but cannot figure out what is causing such large memory leak. Any ideas? Can you confirm if this happens with a subset of GVCFs or only with all of them? Have you tried using CombineGVCFs before running GenotypeGVCFs? 1) I run GenotypeGVCFs on each scaffold, excluding 1 of the 11 GVCFs files at a time for a total of 10 GVCFs in one run; I used the same Java settings and arguments as the ones shown in the post on Sept 18 (-maxAltAlleles 3 -newQual), except -maxNumPLValues 30000000. In the first scaffold I used -Xmx256g but the largest memory usage was ~26Gb (as shown below), thus for the other runs this argument was changed to -Xmx32g. The file f8 seems to be one of the more problematic ones, as for most scaffolds the run finished when this file was excluded. However, different files were problematic for different scaffolds, from which I conclude the problem is more scaffold specific than file specific. In other words, by removing one or a few files probably won't solve the memory issue. 2) I did not consider CombineGVCFs initially as it is usually recommended when more than 200 GVCFs need to be analyzed, and I only have 11 files. 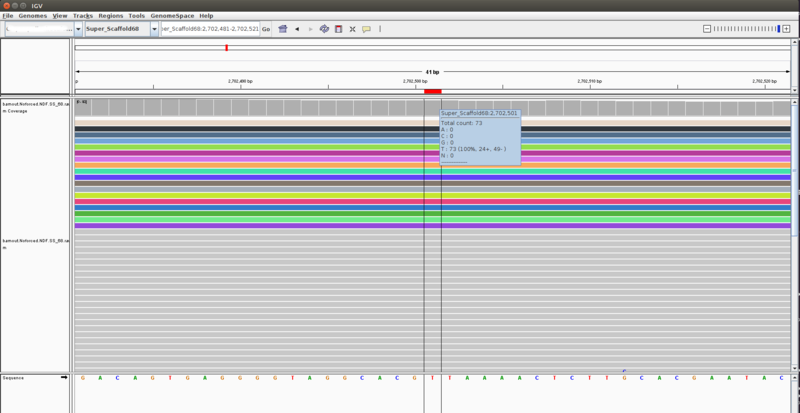 Anyways, I first tried combining all the 11 files but run out of memory even when using -Xmx512g. Then, I combined two cohorts, one of 5 GVCFs and other of 6 (-Xmx256g). CombineGVCF was successful in both cases. Later I run GenotypeGVCFs on those 2 combined files (-V cohort1.g.vcf -V cohort2.g.vcf) with -Xmx216g and -Xmx512g but neither worked. 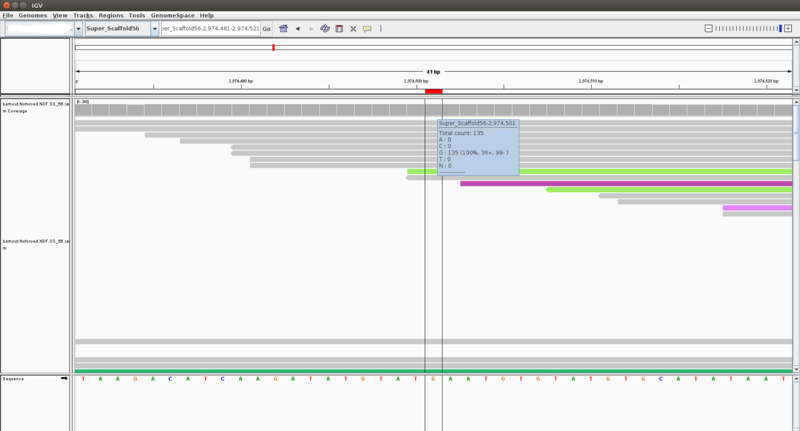 Plan A: Exclude problematic regions from GenotypeGVCF: For this, I first would look at the BAM files and identify the problematic region range (scaffold name, starting and end base). 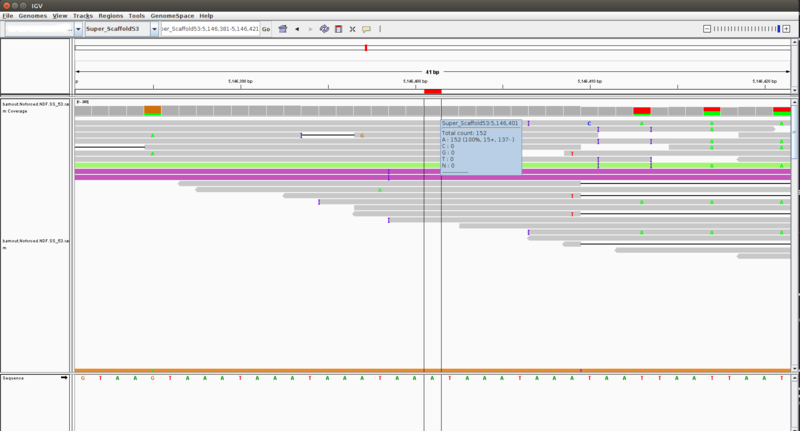 Then run GenotypeGVCFs with the argument -XL to exclude the problematic interval (format: <chr>:<start>-<stop>). - Would it be necesary to add the "padding" argument in this case (-ip)? It would be best if you try Plan A. You can look for sites with a crazy amount of PLs and exclude those sites. Those are likely the most messy and compute-intensive sites. However, you should also look in IGV to check whether you are throwing out interesting areas that may be important in your research. As for including padding, yes you should so you "quarantine" the difficult regions. Another thing to try is reducing the -maxNumPLValues and --max_genotype_count. Thanks a ton for your prompt response and valuable recommendations. a) I am now running HaplotypeCaller on one file (chose f8 because of the previous test) for the 9 challenging scaffolds to obtain the correspondent bamout. My plan is to take a look at the bamout as well as to the bam file in IGV. b. To identify sites with a large amount of PLs, should I just look at the annotations in the gVCF file? c. As per padding, what would be the best strategy to choose a reasonable number? I have seen people using -ip 100, but I wish could do a more informed decision. Would it be OK to base this decision on the bamouts? For example, pick a number of bases away from the complex region where the assembly looks good (e.g., reads with high mappability and quality scores), would that be fine? PS: Hey, no problem. Other people have saved me time by posting their own tests. I hope can do the same for others. Thanks to you guys for providing this level of support through the forums, I really appreciate it! I am inspecting the bamout of file f8 for the 9 challenging scaffolds. Pics below show a zoomed image of the top part of the bamout around the base where GenotypeGVCFs stops (last base reported by the Progress meter in STDOUT). Reads are colored by Tag -> HC. I was expecting a messy alignment, lots of indels, extremely high coverage, or something like that...but I don't really see highly complex regions. Some bases fall within a repetitive sequence but the reads seem to align well, then? Am I missing out something? Any idea on how to troubleshoot this better and hopefully get GenotypeVCF work on those scaffolds? In my last post I forgot to mention that I used such large number for -maxNumPLValues (30,000,000) because previous runs in GenotypeGVCF showed a WARN message indicating that the number of PLs was larger than the initial value I set (10,000), then I explored what was the maximum value in all the files and this was 29,000,000. **Do you think by setting --maxNumPLValues to 100,000 and --max_genotype_count to 100 would reduce the memory resources required by GenotypeGVCF? ...it did not work either, it stops at the very same region as before. OK, thanks a lot for the heads-up. Would it be possible to mention that in the documentation? This would be helpful for others in a similar situation . 1. Is it OK if I ignore the WARN messages indicating there are regions with larger number of PLs than 100 (default)? Would that affect the SNP calling of subsequent regions? 2. I am mostly interested on point mutations which have 4 possible bases, thus I was wondering if using -maxAltAlleles 3 to limit the program to consider the REF allele (e.g. A) and 3 alternative alleles (T, C, G) would affect SNP calling or realignment around indels? How to choose an appropriate --max_genotype_count value for a given dataset? Should this selection be informed by the formula described by Shee here? Would this value be OK for my case, considering I am mostly interested on SNPs? May the setting of such stringent number of genotypes bias variant calling or the consideration of indels as alternative alleles? How many PLs should be printed in output when I am only interested on SNPs? The same a the max. number of genotypes (286 in the example)? It is probably crashing because the compute is just too much. I would start by checking which sites are messy/have too many alternate alleles in the VCF. Then, you can check in IGV and make sure you are not missing any valuable information in those sites you wish to exclude. To identify sites with a large amount of PLs, should I just look at the annotations in the gVCF file? 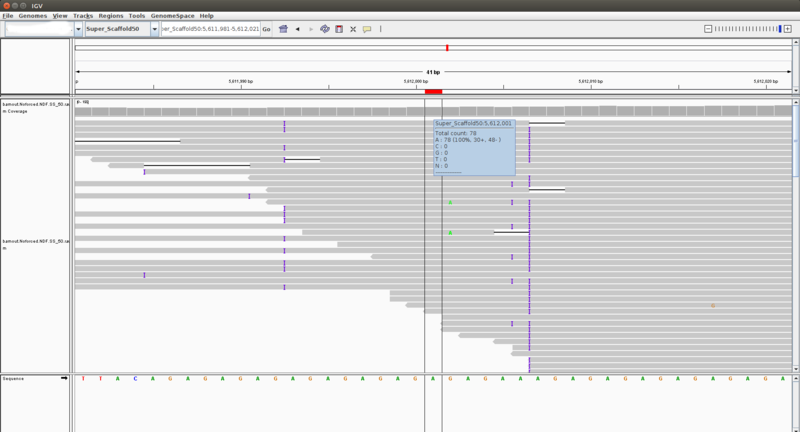 Yes, you can look at either the PL field or the alternate alleles column. The more alternate alleles there are, the messier the region/site. You can simplify this by selecting only for multiallelic sites with SelectVariants. As per padding, what would be the best strategy to choose a reasonable number? I think if a site is very messy, usually the whole region around it is messy (due to bad mapping or artifacts). I would start with 100, but if you find in your analysis that that is too much or too little, you can tweak it. For those tricky repeat regions, you can try setting some extra arguments mentioned here under "7. Try fiddling with graph arguments (ADVANCED)". Also, before your start the massive run, can you try just running on a snippet of the region (~300 bases before and after the sites of interest)? Thanks a lot for responding my original questions and for your recommendations. I decided to abort the plan of excluding problematic regions as I did not observe a clear pattern that applies to all of them. Instead, I run HaplotypeCaller for each of the 9 challenging scaffolds using two different sets of values ("relax" and "stringent") for the arguments -max_genotype_count and -maxAltAlleles, assuming it is OK no variants are called at the regions that have large number of PLs as they are generally messy and most likely not informative. Later I run GenotypeGVCFs per scaffold for the cohort of 11 GVCFS. I am glad to share that most runs finished successfully except for one scaffold of the "relaxed" set despite I assigned 256gb of RAM to this job. Now I am in the dilemma to decide which set of values for these arguments is more appropriate for my dataset. Would you please take a look at questions posted on Sep 22 and 25? 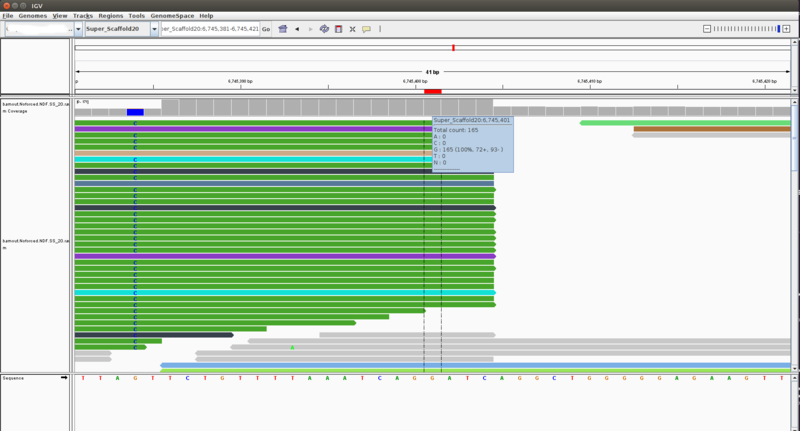 Then I run GenotypeGVCFs one scaffold at a time for the 11 GVCFs using -Xmx 32g. 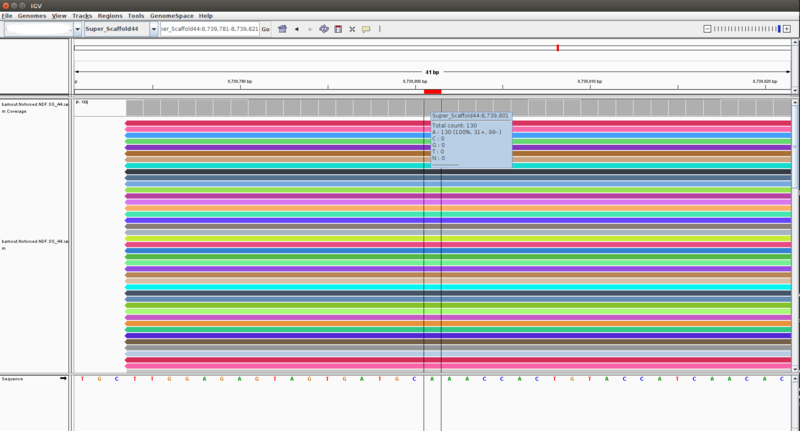 In the very first run of the HaplotypeCaller I set -maxNumPLValues 10000 because some regions had 8000-9000 PLs. 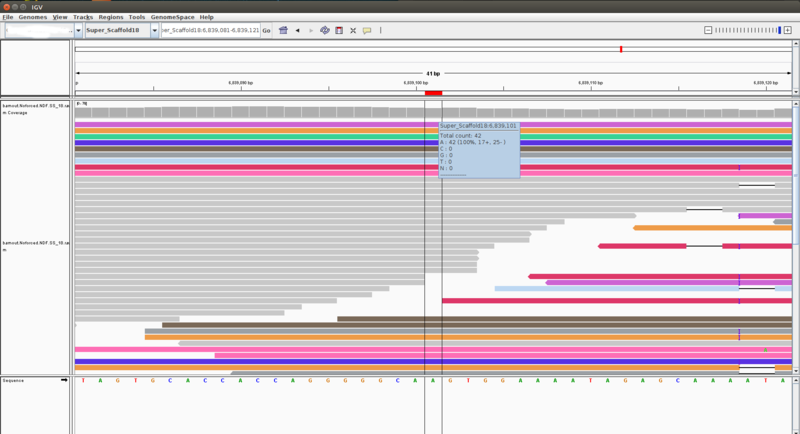 However, this number of PLs produced the memory issue I encountered when running GenotypeGVCFs. If regions with too many PLs are messy and not informative, I don't mind the program skip over them. As far as I understand the -maxNumPLValues only limits the PLs printed in the gVCF file but not the actual PLs calculated internally by the algorithm for all the genotypes found, is that right? Thus, would it be OK to keep it simple and leave this argument in 100? Yes, the argument only limits the number of PLs output to the GVCF. This is more for saving compute in the GenotypeGVCFs step rather than in the HaplotypeCaller step. You can try limiting it to 100, but you can also try a higher number if you wish. If you are interested in experimenting (which it seems like you are ) I would try playing with the thresholds until you find ones that give you the best sensitivity in both HaplotypeCaller and GenotypeGVCFs. Try the settings you mentioned for GenotypeGVCFs, and if those work, try being a little less stringent. Good luck and let us know how things go. Thanks a lot to you both for all your recommendations I really appreciated it! Sure, I will keep you posted. I just wanted to share that by excluding a repetitive region that starts at the base where HaplotypeCaller used to crash was suffice to fix the problem. I identified the start and end bases in the BAMOUT files and excluded this region using the command -XL in the run of the HaplotypeCaller. This job just required 32 GB of RAM.